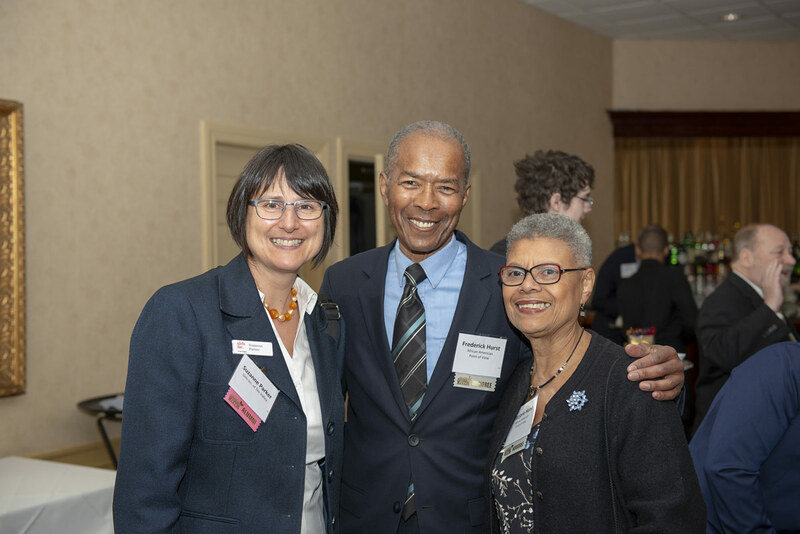 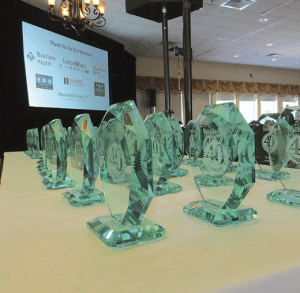 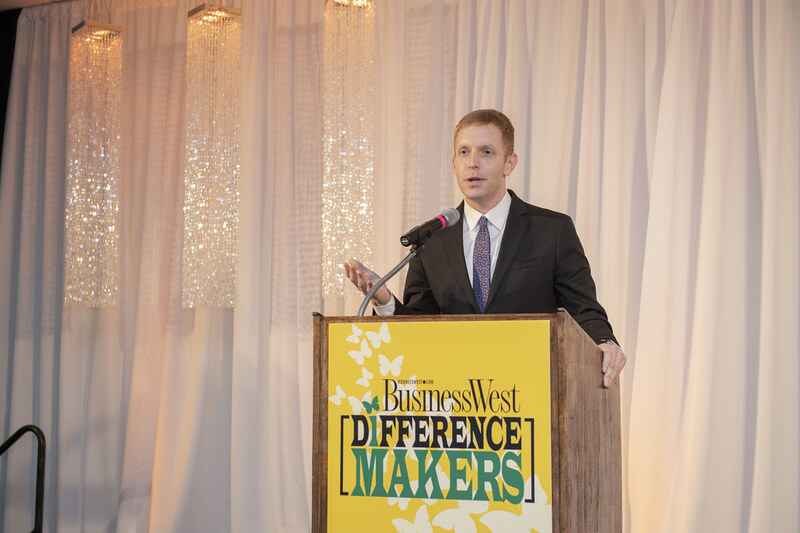 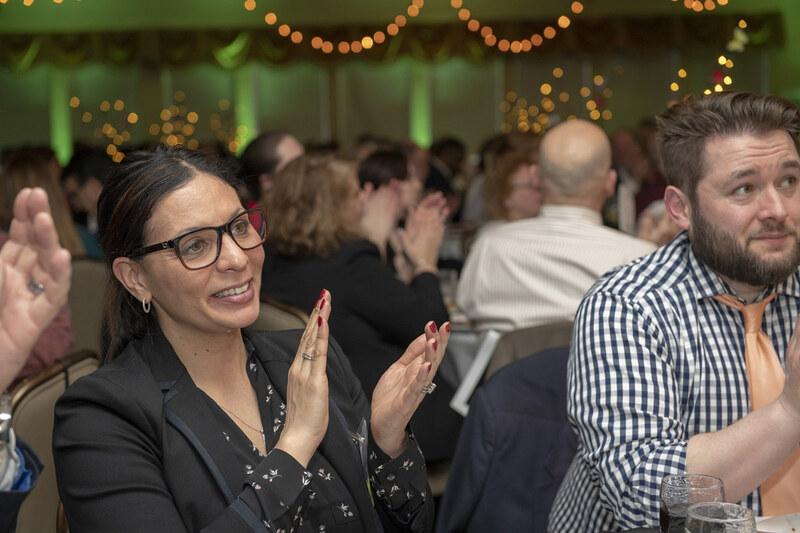 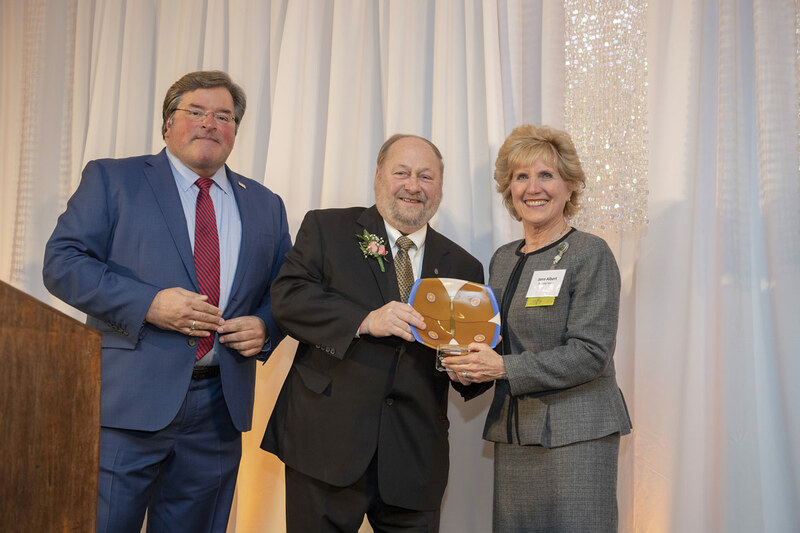 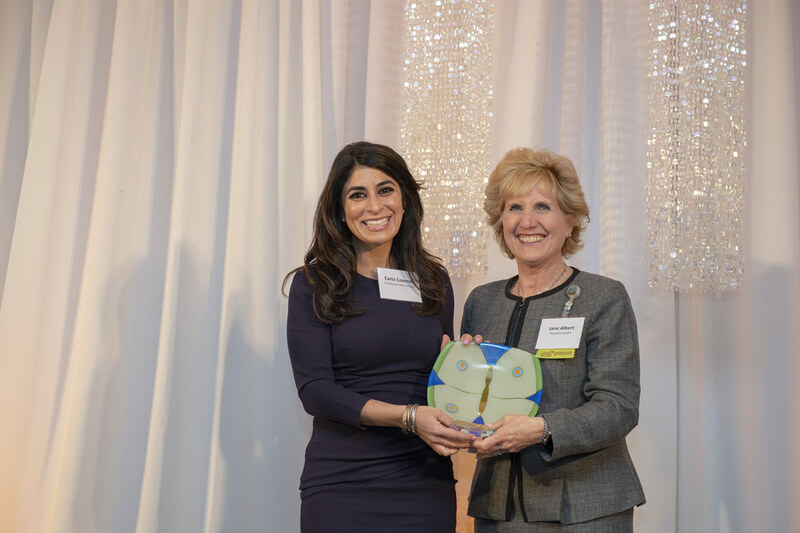 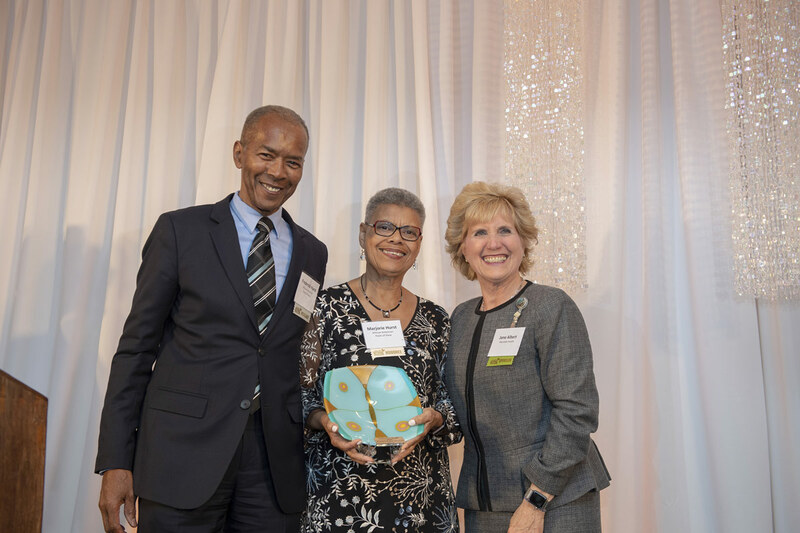 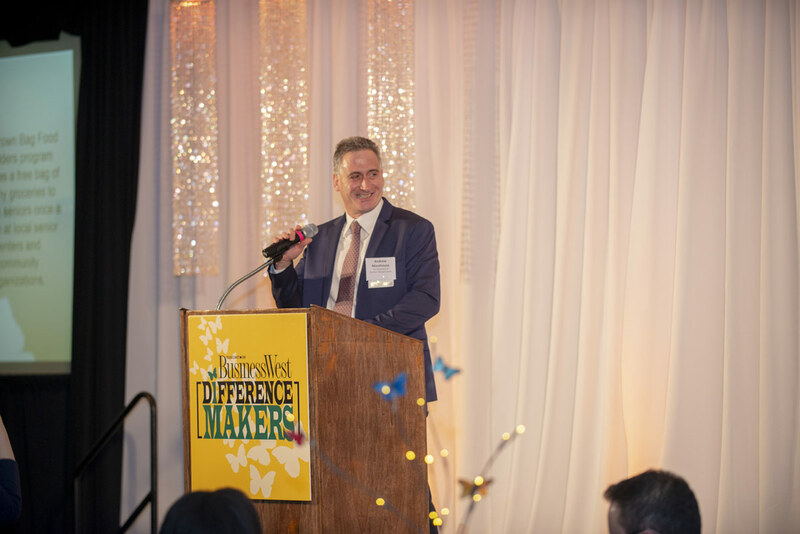 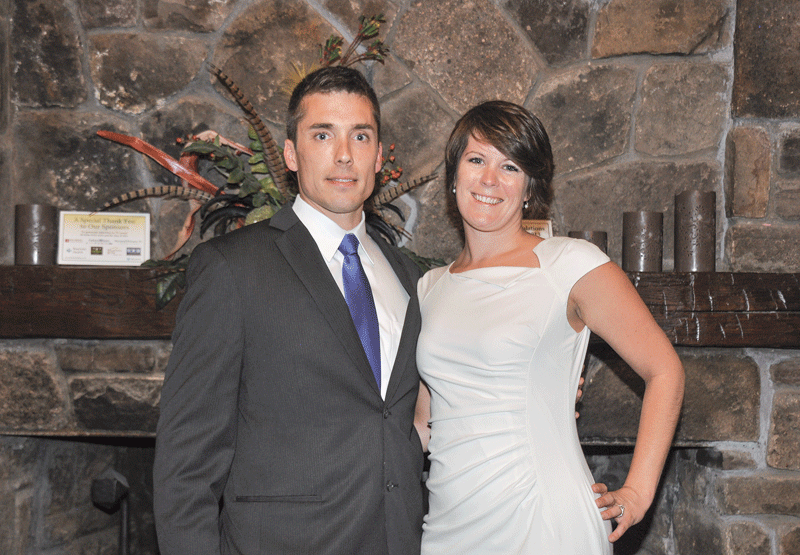 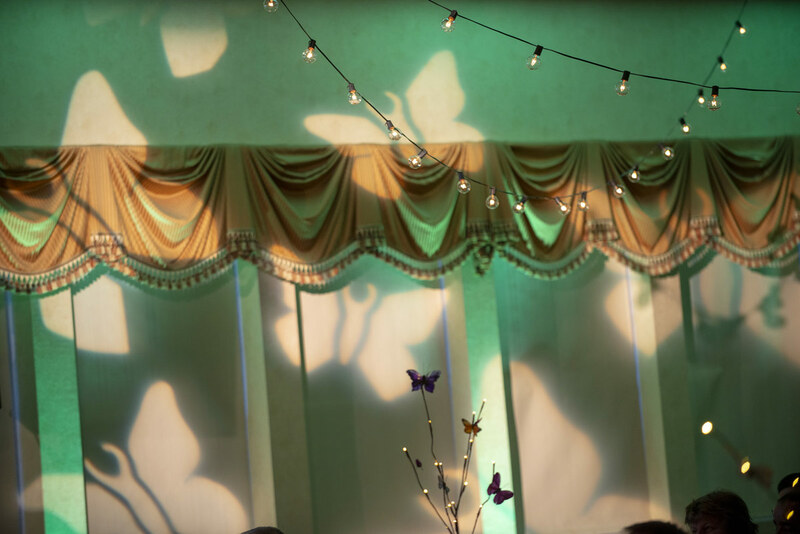 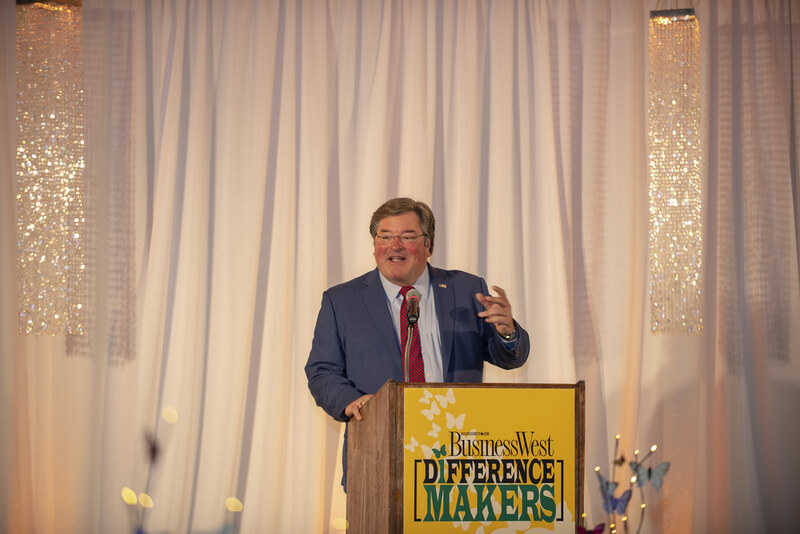 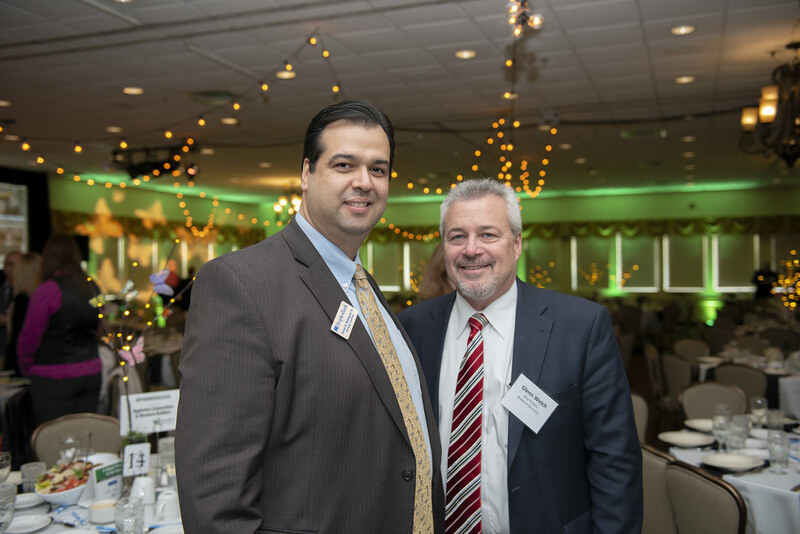 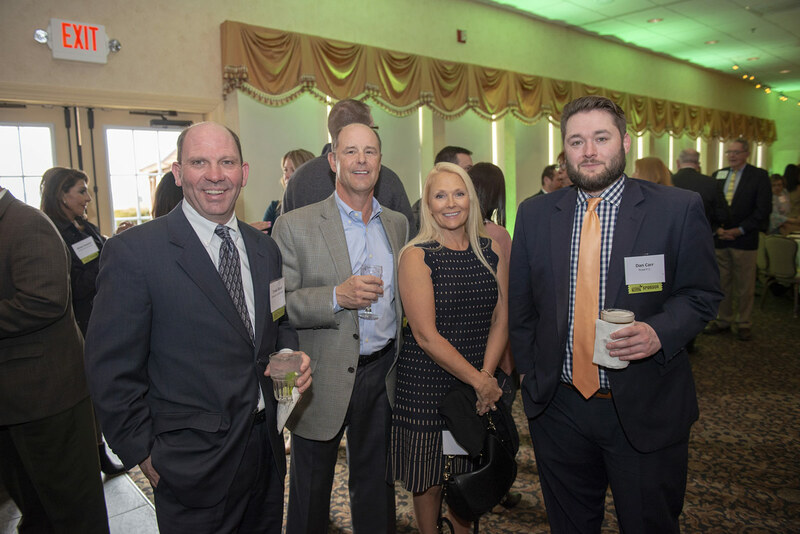 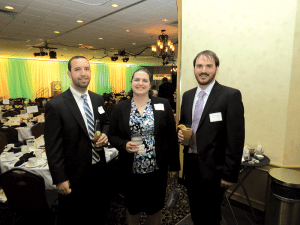 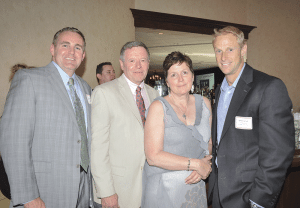 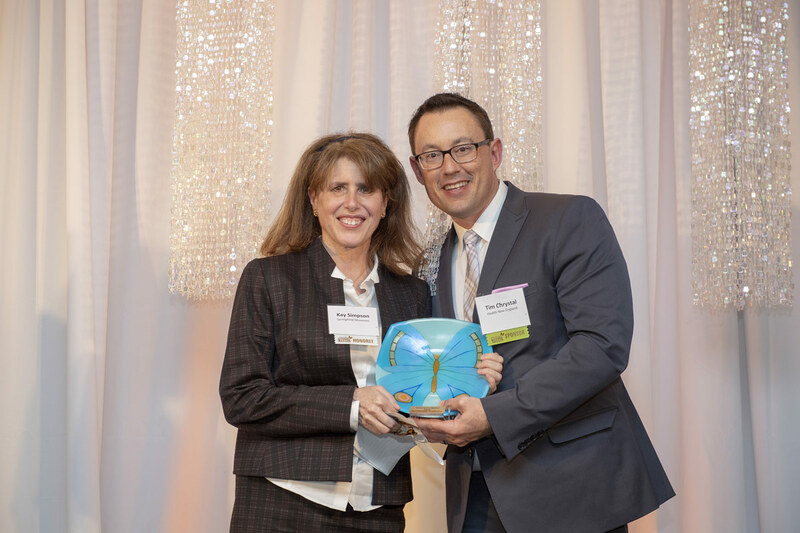 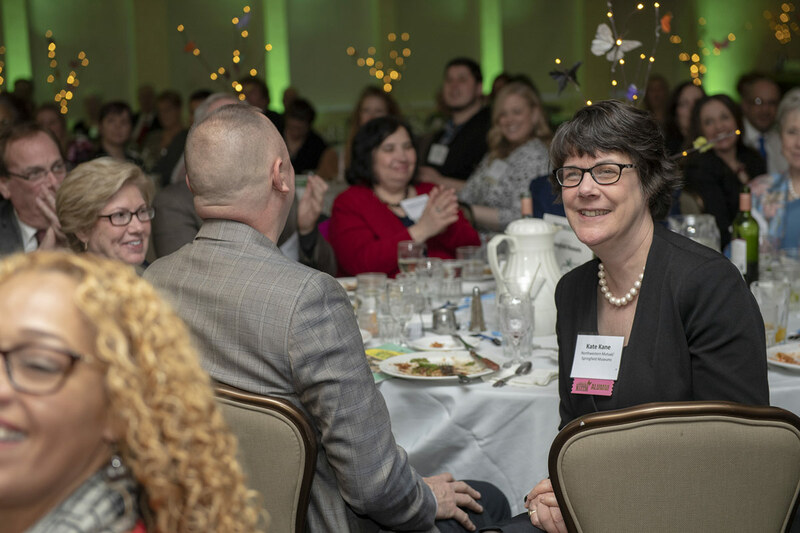 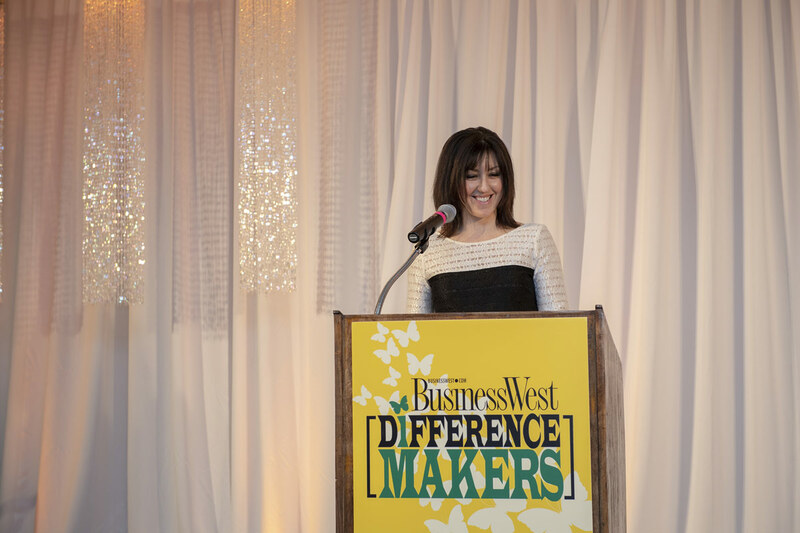 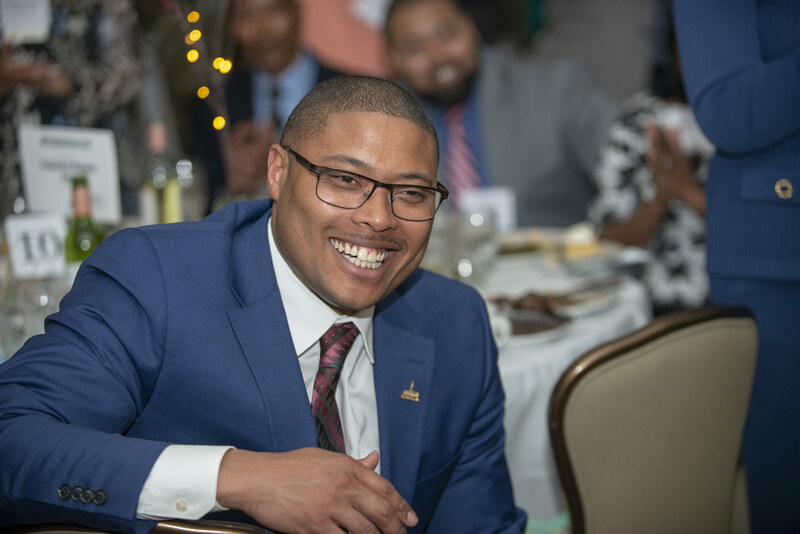 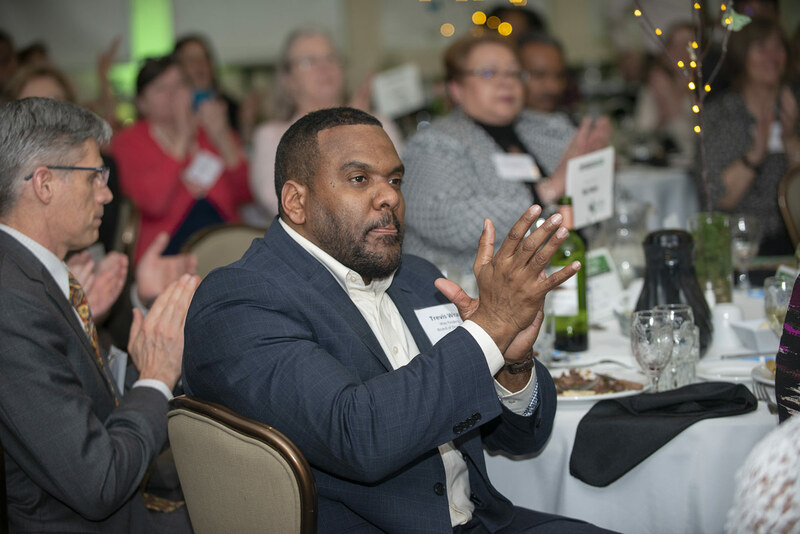 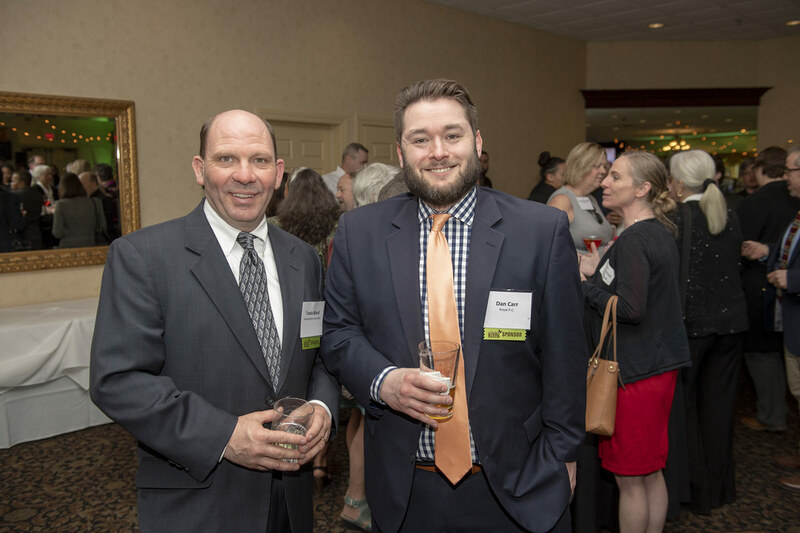 More than 650 people flocked to the Log Cabin Banquet & Meeting House on June 20 to celebrate BusinessWest’s 40 Under Forty Class of 2013 and the many accomplishments of its members. 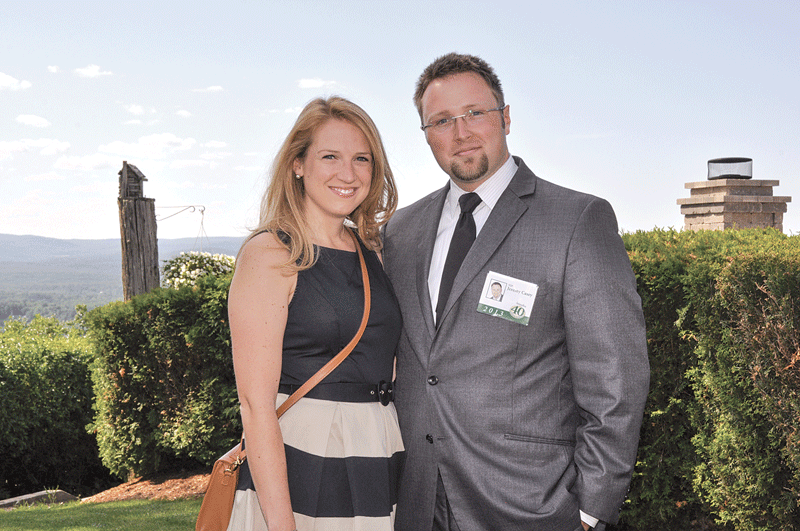 Attendees enjoyed picture perfect weather, fine food, and perhaps the best networking event of the year. 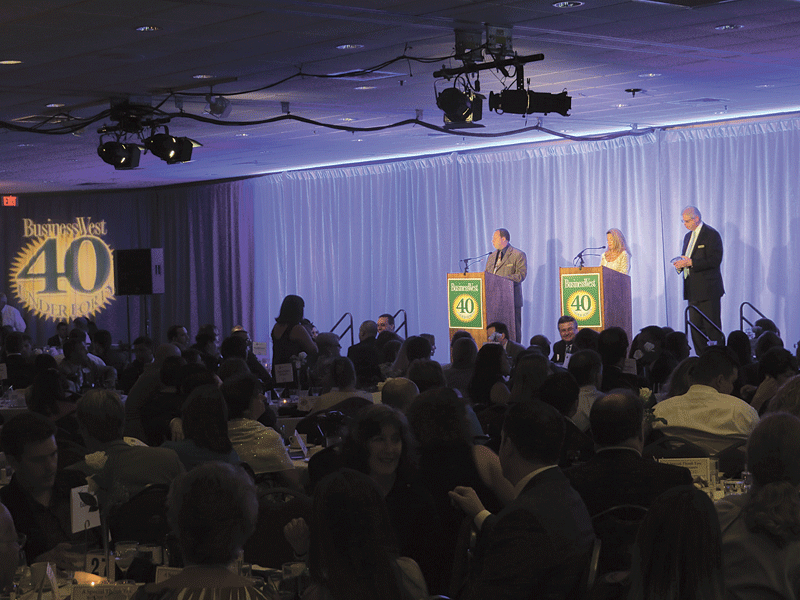 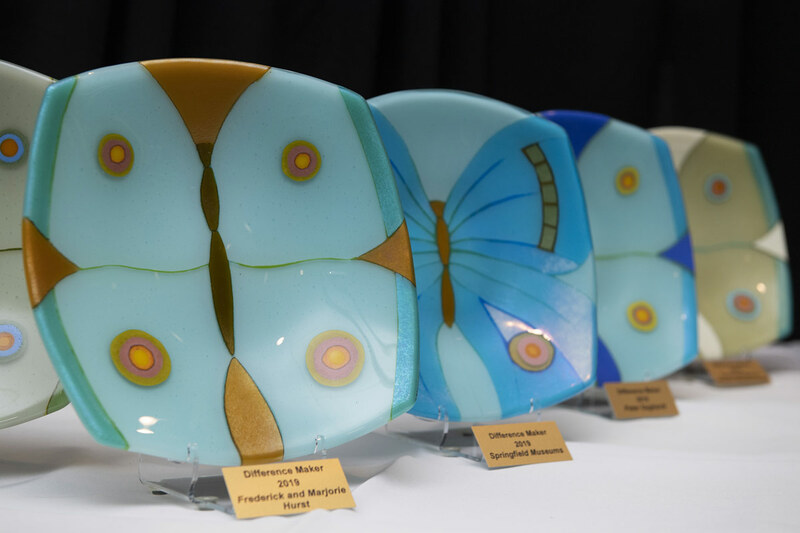 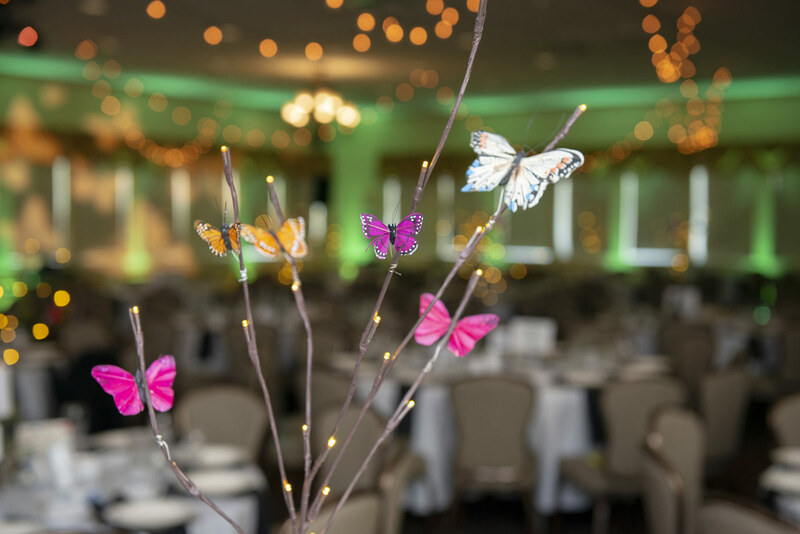 On the pages that follow, we offer a photographic look back at a memorable evening for all those in attendance, but especially those who walked out with the 40 Under Forty plaques, seen at left, just prior to the start of the gala. Check out the intro video from Viz-Bang! 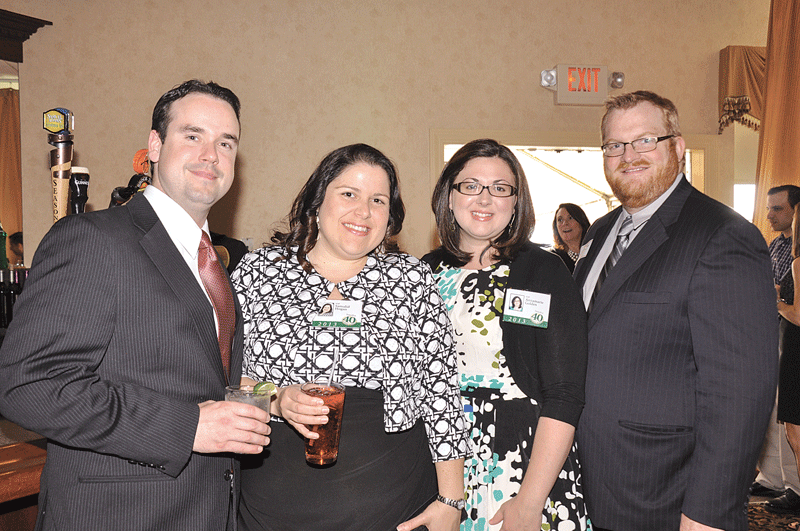 From left, Robert Hogan, quality control supervisor for U.S. Tsubaki, and his wife Samalid Hogan, senior project manager for the City of Springfield, with her fellow Class of 2013 honoree, Annamarie Golden, manager of Community Relations and Community Benefits, Baystate Health, and husband Hunter Golden, owner of Write Stuff Copywriting. 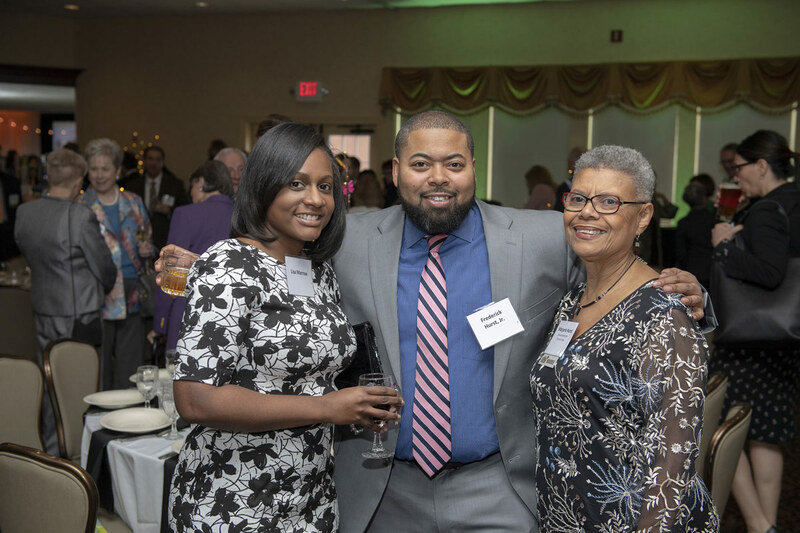 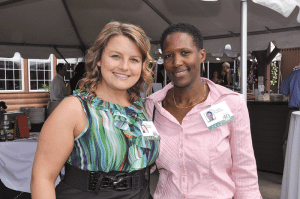 Elizabeth Beaudry, senior commercial credit analyst and information technology administrator, and Shonda Pettiford, assistant director of Commonwealth Honors College at UMass Amherst, two members of the Class of 201,3 share a moment before the awards ceremony. 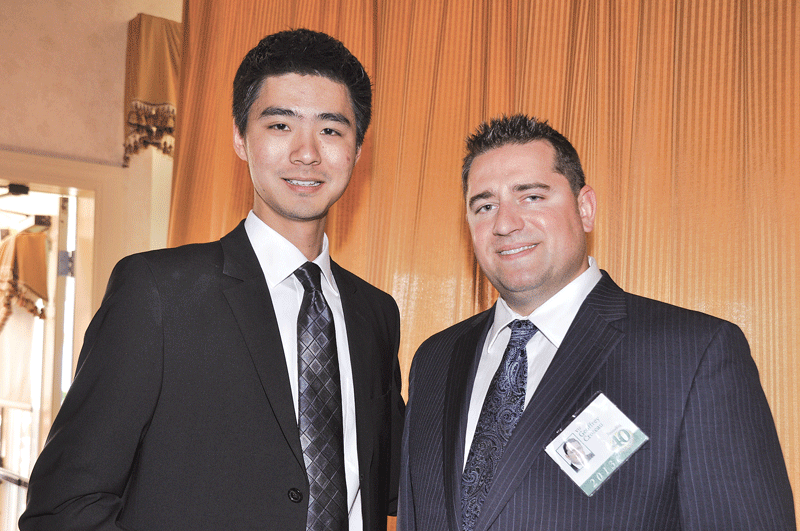 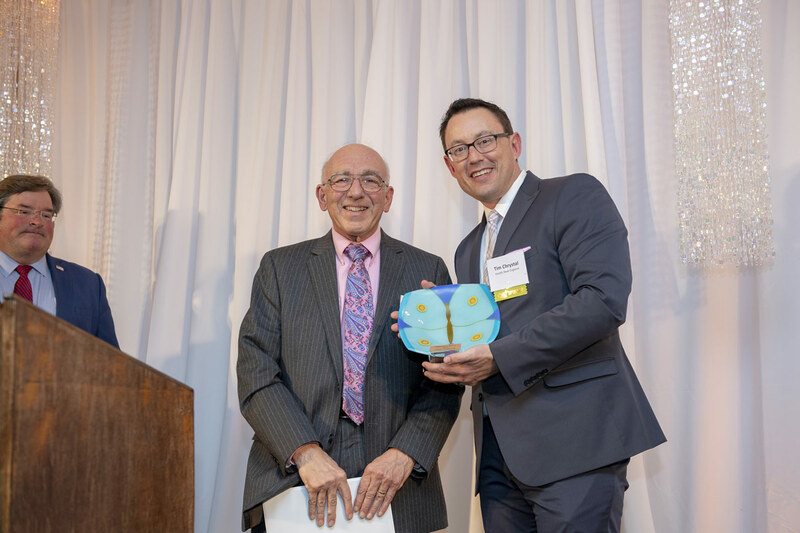 Xiaolei Hua, credit analyst at PeoplesBank and fellow Class of 2013 honoree Geoffrey Croteau, financial advisor and managing associate sales manager at MassMutual Charter Oak Insurance and Financial Services network during the VIP hour in the Grand Edna Ballroom. 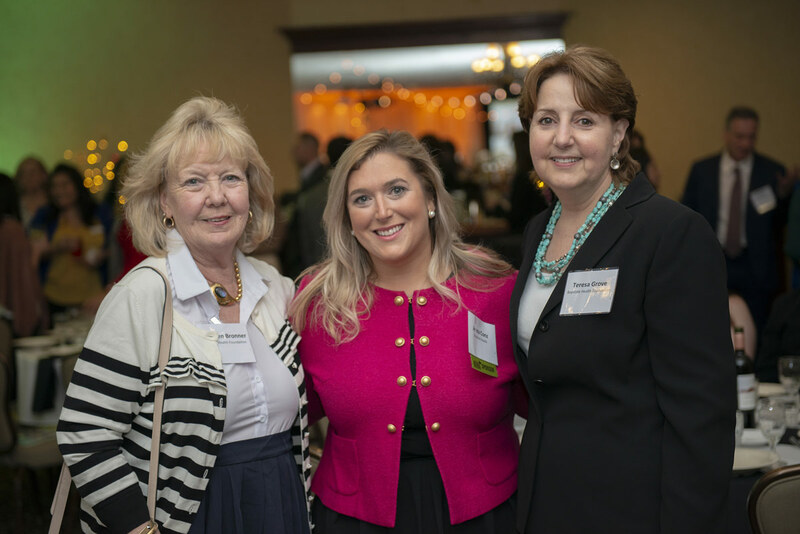 Representing one of the evening’s sponsors, Hampden Bank, is Nora Braska, assistant vice president and training officer; Peg Daoust, branch manager; and Amy Scribner, assistant vice president and senior marketing administrator. 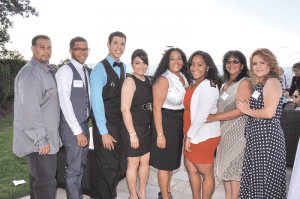 From left, Jose Hernandez, machine operator for Rockbestos-Suprenant Cable Corporation; Alejandro Cameron, John Rivas, and Zydalis Zayas, WGBY-TV community engagement associates; Class of 2013 honoree, Vanessa Pabon, director of community engagement for WGBY-TV; Pabon’s daughter, Shayla Burge, and mother, Milta Franco, a case manager for Brightwood Health Center; and Veronica Garcia, WGBY community engagement assistant. 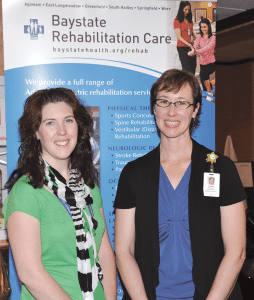 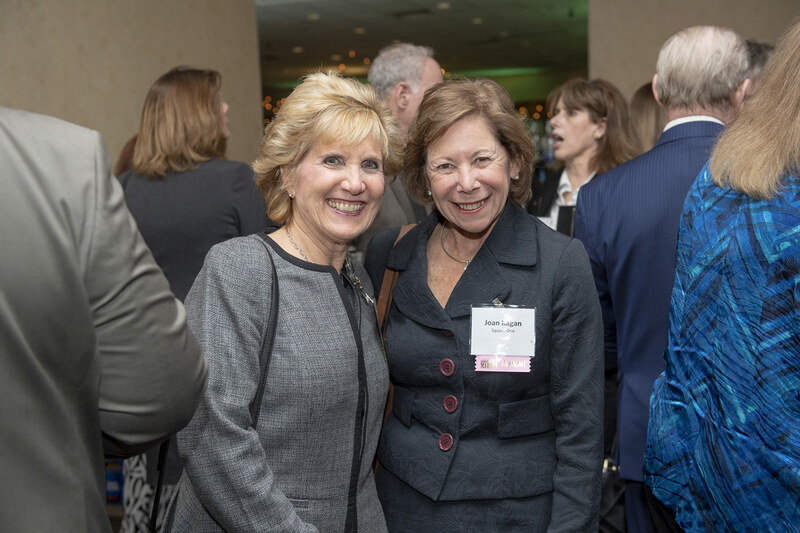 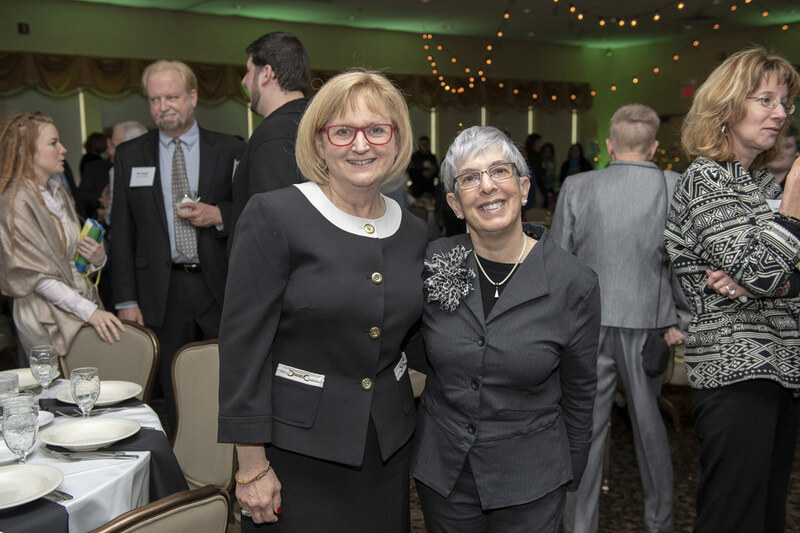 Emily McArdle, left, physical therapist and Jeanne Coburn, audiologist, both of Baystate Rehabilitation Care, one of the evening’s sponsors. 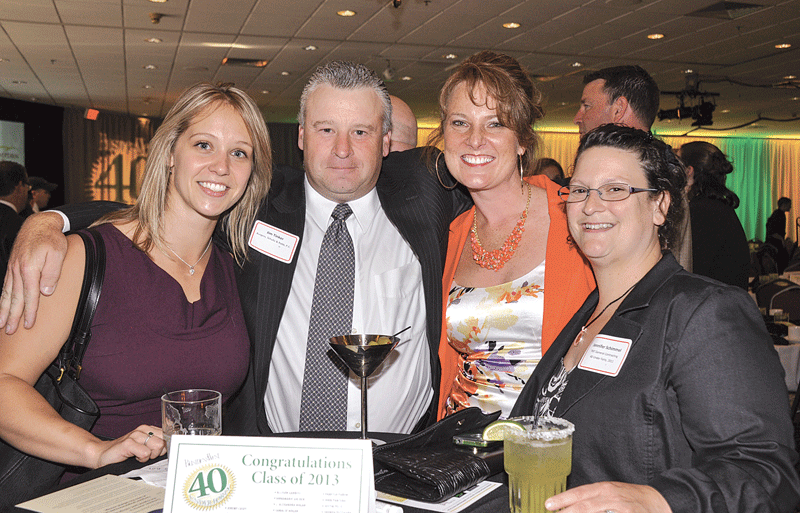 From left, Danielle Nicklas, an attorney with Cooley Shrair, and Jim Tinker, senior tax accountant, Burgess, Shultz & Robb, network with Amy Scott, president of Wild Apple Design Group, and Jennifer Schimmel Stanley, executive director of Greater Springfield Habitat for Humanity, both members of the 40 Under Forty Class of 2011. 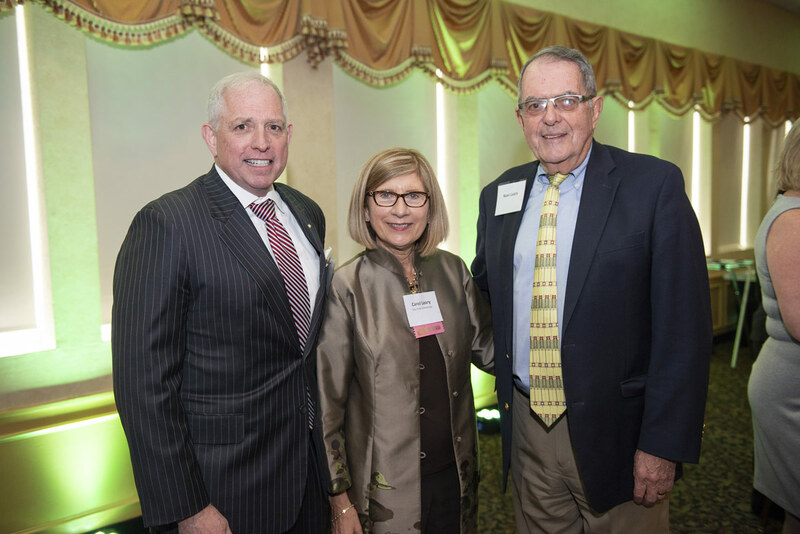 From left, Patrick Leary, Class of 2007, shareholder and vice president of Moriarity & Primack, P.C., an event sponsor, networks with Gwen Burke, senior advertising consultant with BusinessWest, her husband Chuck Burke, president of Action Marine and Water Sports, and Damon Cartelli, member of the Class of 2010, and president and general manager of Fathers & Sons, also an event sponsor. The team at UMass Amherst Isenberg School of Management, an event sponsor, gathers before the awards ceremony. 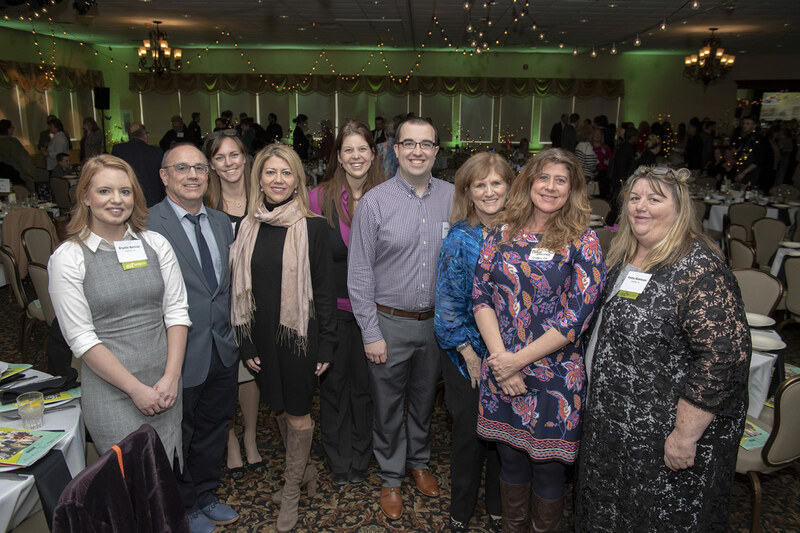 From left, Trista Hevey, program information specialist; Michelle Rup, office manager; Jennifer Meunier, director of Business Development; Kyle Bate, academic advisor and program developer; Melissa Garrett-Preston, academic advisor; Allison Furkey, media PR liaison; and Rachel Trafford, director of Organizational Metrix. 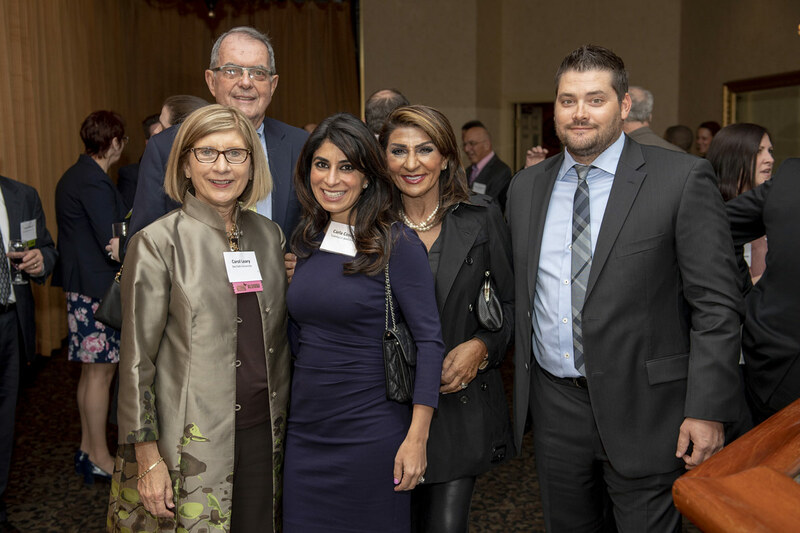 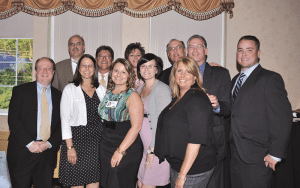 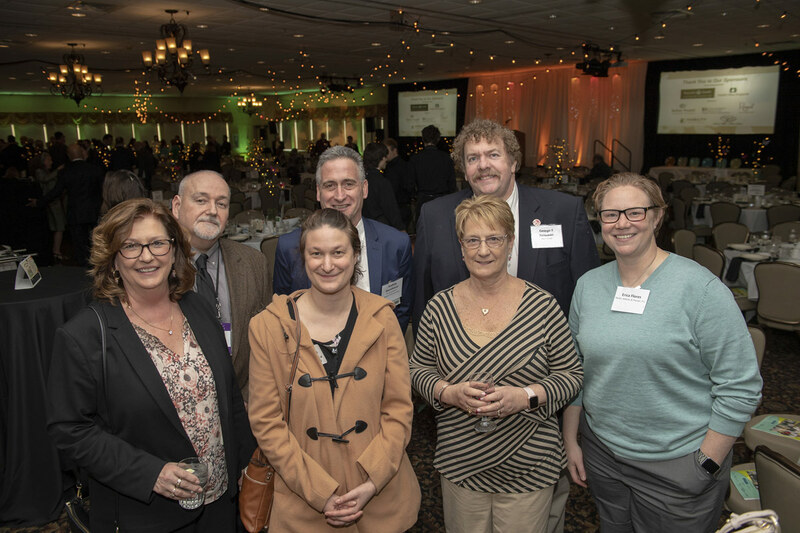 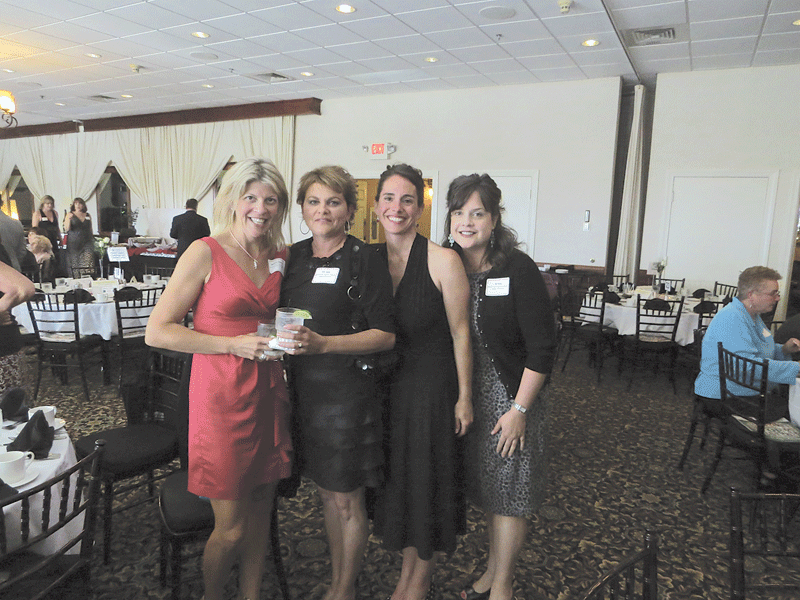 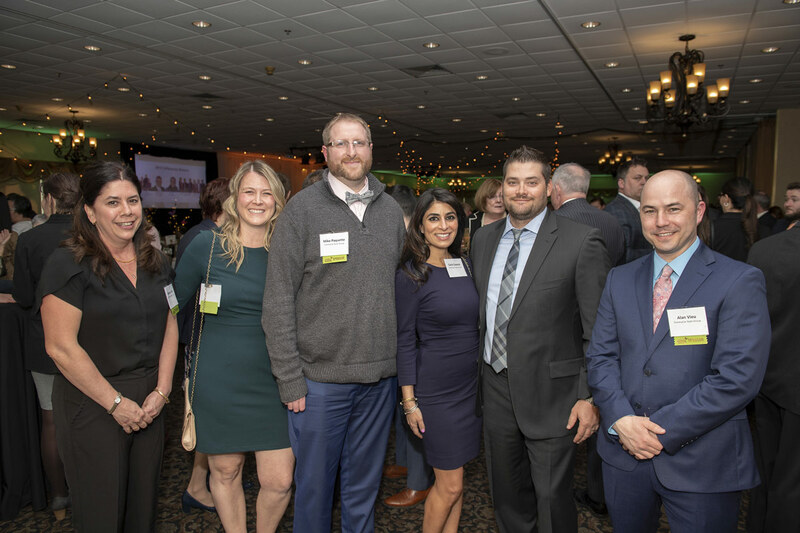 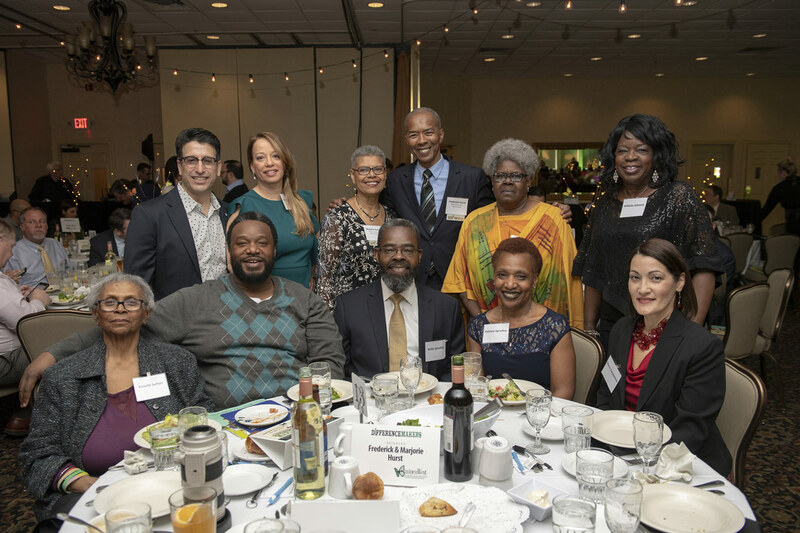 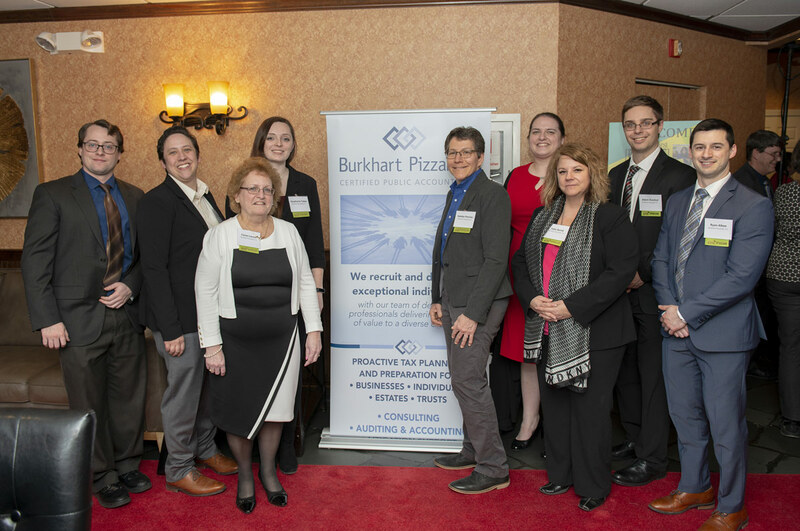 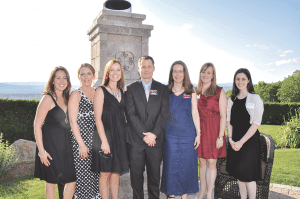 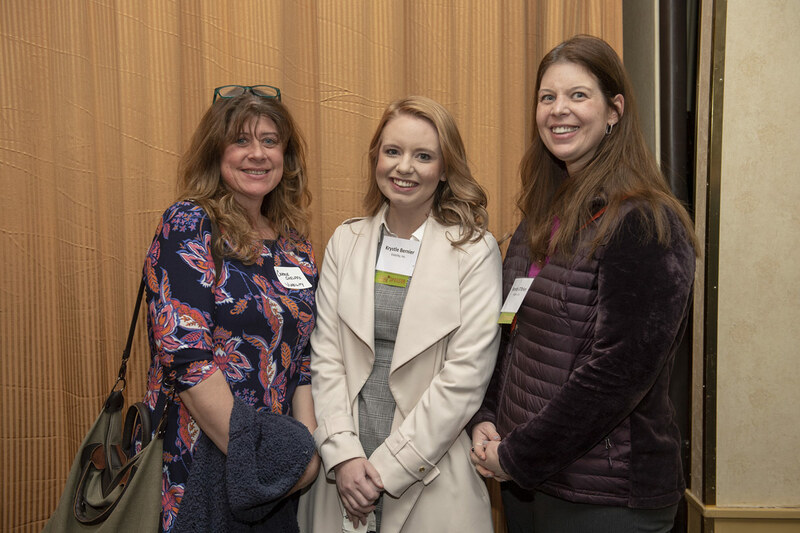 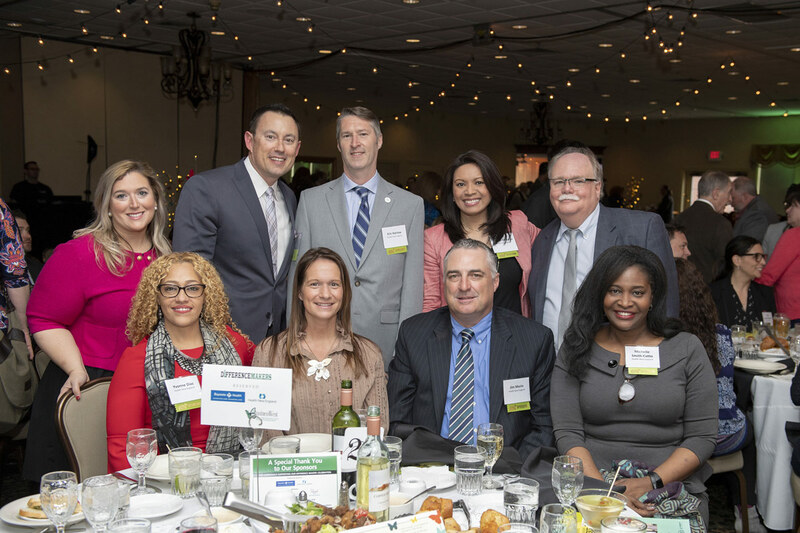 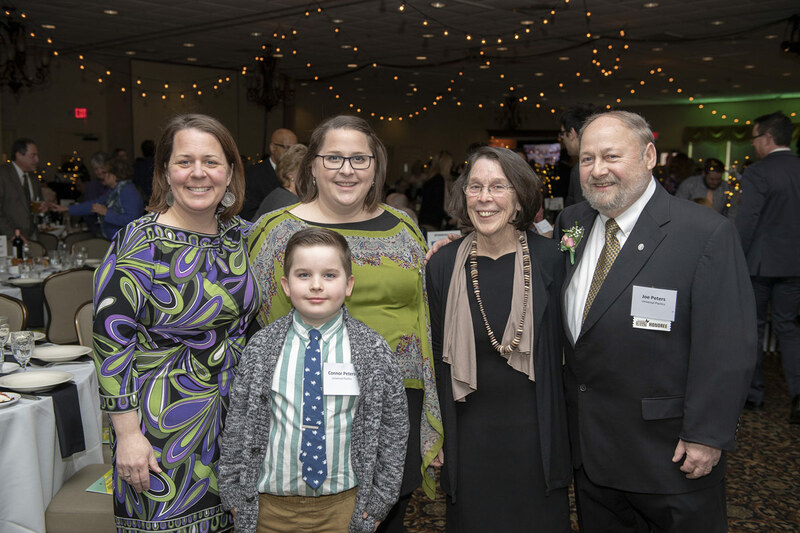 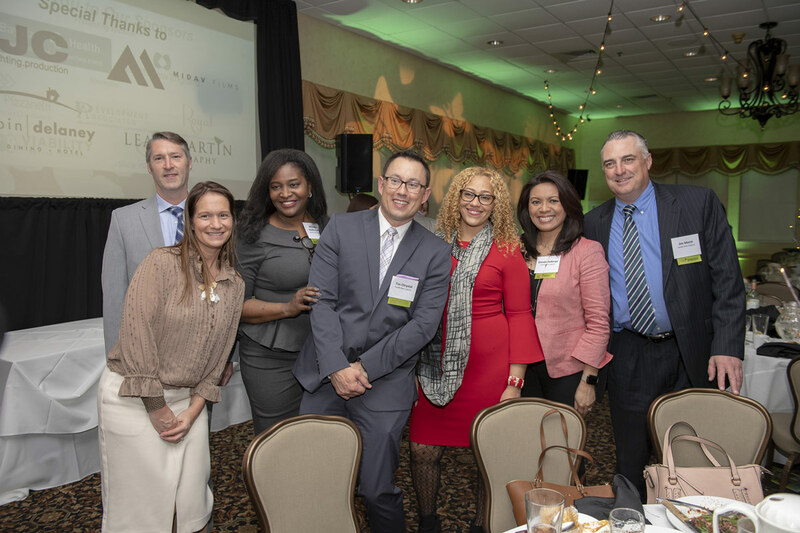 The NUVO Bank & Trust Company team supported Class of 2013 honoree, Elizabeth Beaudry (fifth from left), senior commercial credit analyst and information technology administrator. 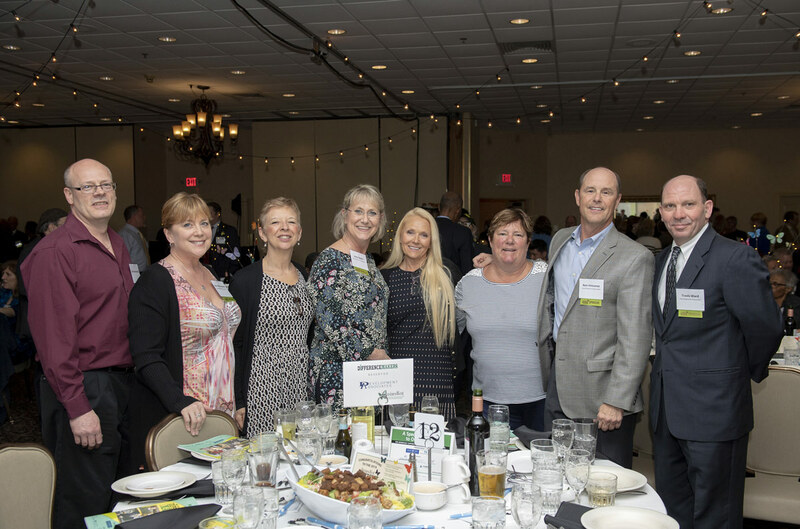 Front row, from left, Michael Buckmaster, vice president, commercial lending; Leslie Ross Lawrence, senior vice president/CCO and SOO; Beaudry; Jackalyn Guenette, loan deposit operations agent; Sue Fearn, assistant vice president, client sales and service; back row; Jay Caron, president and CEO, Bee-Line Corp., and NUVO board of director; Jeff Sattler, president and senior loan officer; Denise Perkins, corporate secretary; Dale Janes, CEO; Jay Seyler, vice president, commercial loan division; and Eric Jalbert, credit analyst. 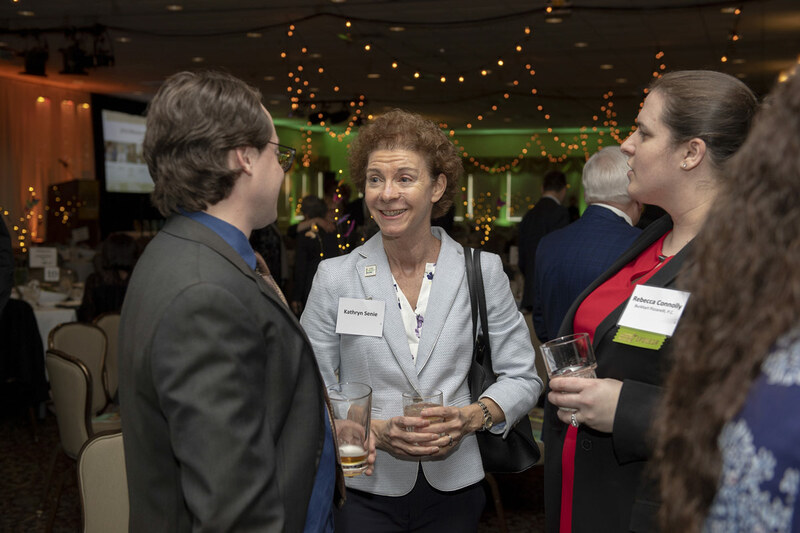 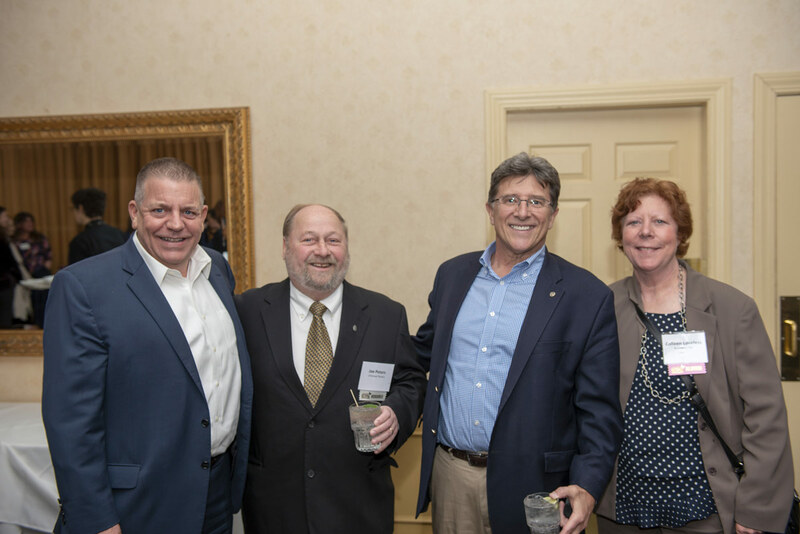 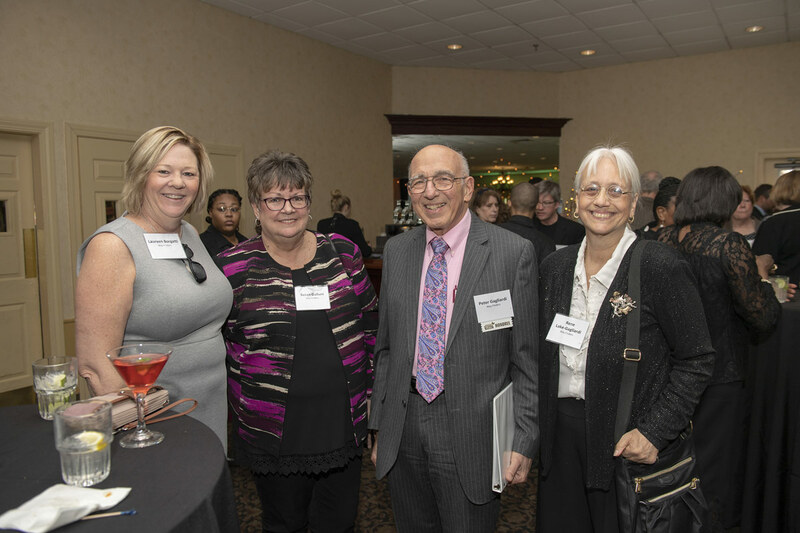 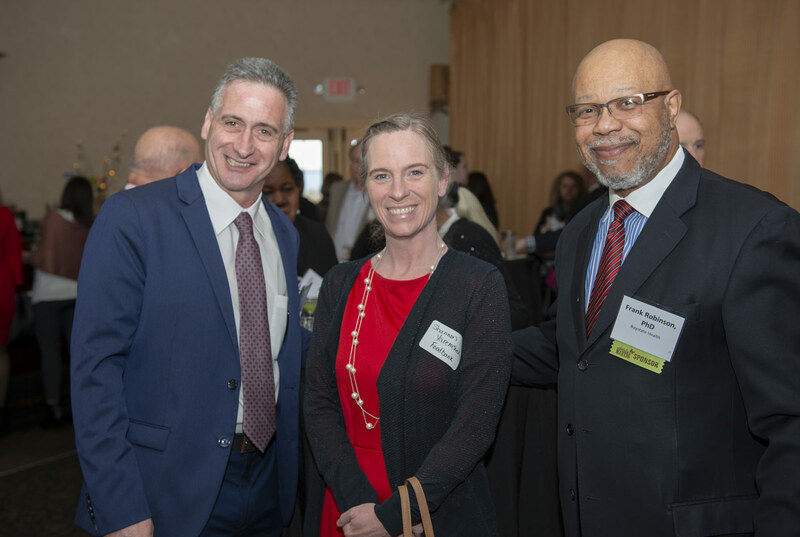 Gary Popovich, left, and Daniel Duncan, accounting associates, chat with Rebecca Connolly, audit manager, all of Moriarty & Primack, one of the event sponsors. Brenna Murphy McGee, Holyoke city councilor and member of the Class of 2013, with her husband, Todd McGee, Class of 2011, director, E&B Planning at Mass Mutual, and fellow Holyoke city councilor. 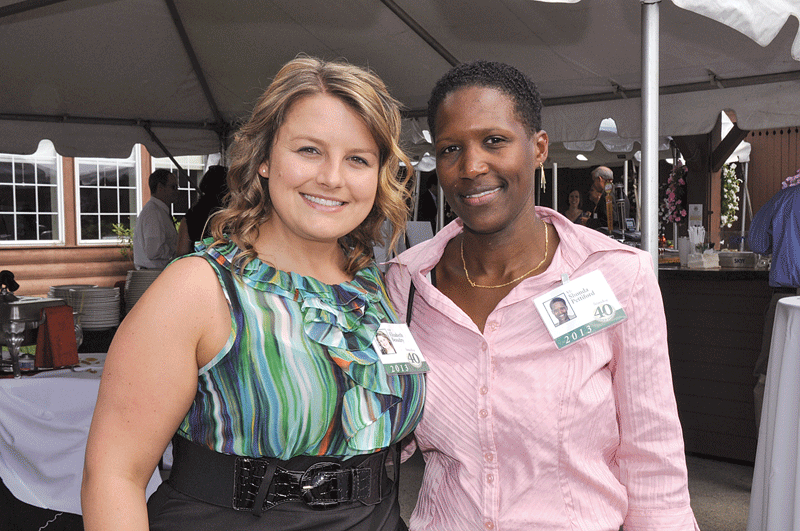 Delcie Bean, Class of 2008 and founder and CEO of event sponsor Paragus IT, spoke to the audience of more than 650 people about the need for a computer technology-mentoring program that will benefit local youths, create jobs, and attract businesses to the Pioneer Valley through the reorganization of Valley Technology Outreach. 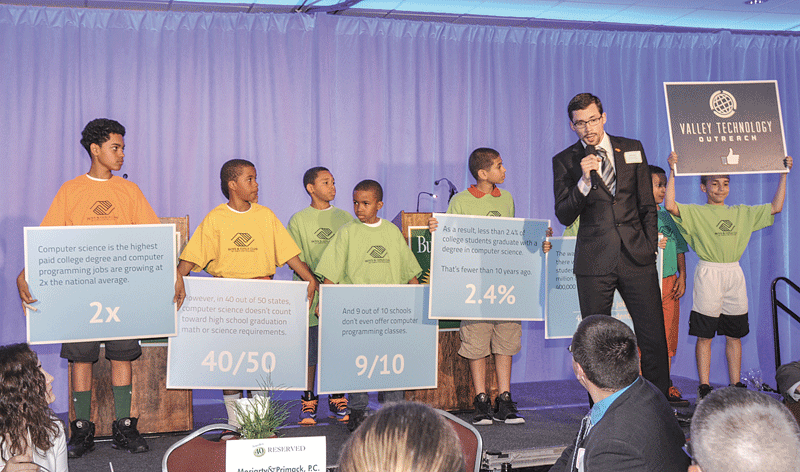 Here, Bean is assisted by children from the Westfield Boys and Girls Club, who demonstrated the national numbers that underscore the need for more educational support through computer technology. 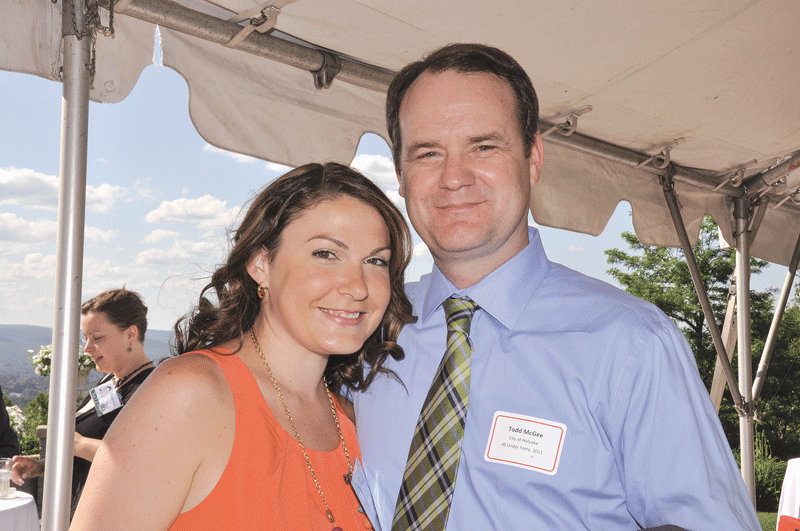 Caitlin Casey, occupational therapist with Hartford Healthcare, and husband Jeremy Casey, assistant vice president and commercial service officer, Westfield Bank, celebrate his standing as a member of the Class of 2013. 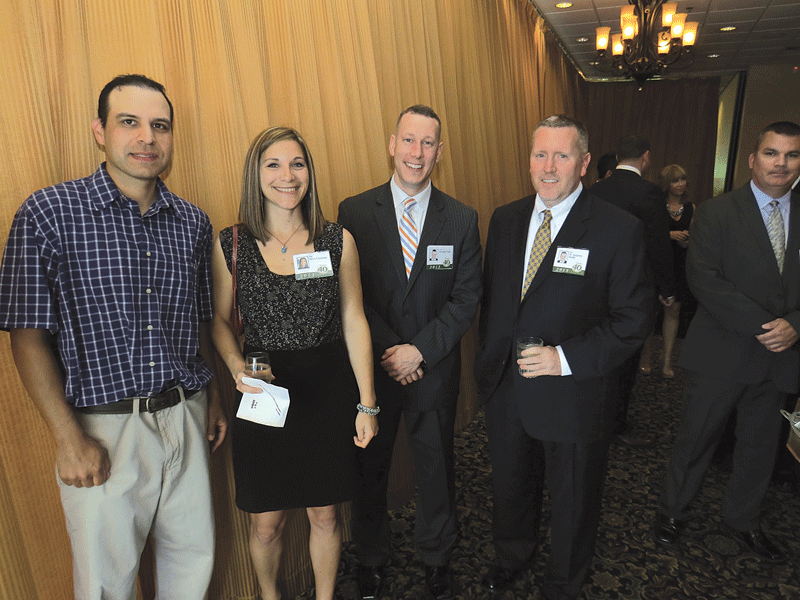 From left, Darren Couture, painting contractor; Erin Couture, Class of 2013, vice president and commercial loan officer, Florence Savings Bank; Jeremy Leap, Class of 2013, vice president of commercial lending for Country Bank; and Andy Robb, Class of 2013, president, Burgess, Schultz & Robb, P.C. Timothy Brunelle, employee of L-3 KEO, and wife Erin Fontaine Brunelle, realtor, Century 21 Hometown Associates, founder, co-chair of Buy Holyoke and a member of the Class of 2013. 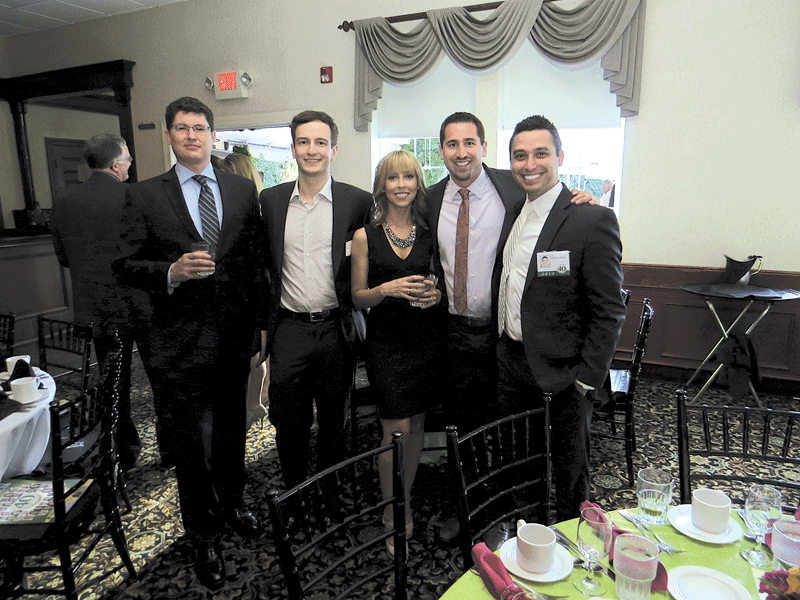 From left, Evan Alberts, practice manager and financial services professional, MassMutual Charter Oak Insurance and Financial Services; Ian Vukovich, Class of 2010, director of product delivery, MassMutual-USIG; Erin Kates, Baystate Health; Matt Geffin, Class of 2011, vice president of business development, Webber and Grinnell Insurance; and Danny Kates, Class of 2013, managing associate, MassMutual Charter Oak Insurance and Financial Services. From left, Michael Hayden, owner, Springfield Motors; Ashley Bernard, speech pathologist, Springfield Public Schools, Nick Zajac, loan officer, Top Flight Financial; Carla Cosenzi, Class of 2012, and Tommy Cosenzi, Class of 2013, co-owners of TommyCar Auto Group; Amanda Douglas, esthetician at Puffers Day Spa and Salon; and Trevor Wood, engineer, City of Westfield. 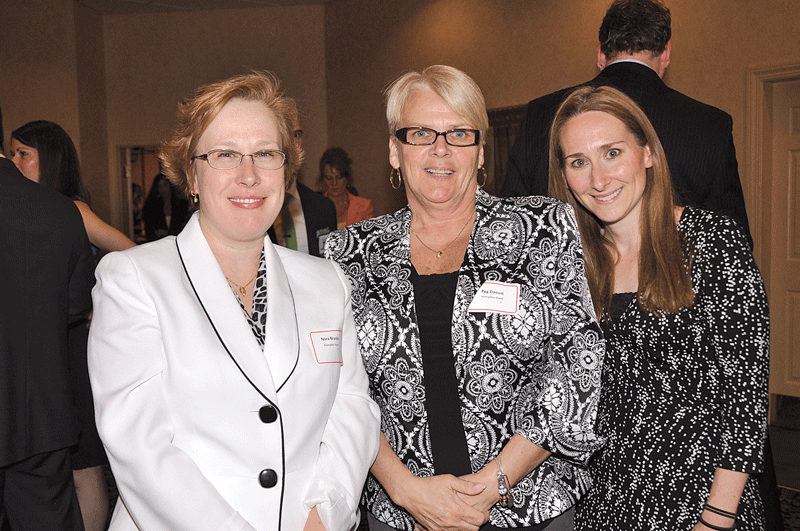 From left, Melissa Mattison, clinical assistant professor, Western New England University (WNEU); Kim Gallo, staff Assistant, WNEU College of Pharmacy; Kam Capoccia, Class of 2013, associate professor of pharmacy practice, WNEU; and Jill Popp, Department of Research, Connecticut Children’s Medical Center, network in the Southampton Room. 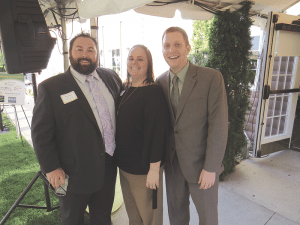 Chris Thompson, left, Class of 2009, vice president, business development, Springfield Falcons Hockey, networks with Jill Monson, Class of 2010, CEO, Inspired Marketing; and Alex Morse, mayor of Holyoke. 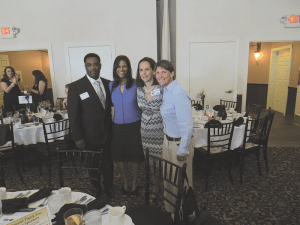 From left, John Roberson, vice president, Children & Family Services; Ja’net Smith, program director, Juvenile Programs, both with the Center for Human Development; Jennifer Root, Class of 2013, clinical director for the Center for Human Development; and Kate Blachfield, manager, HP Hood. From left, Joe Bednar, senior writer, and Elizabeth Taras, staff writer at BusinessWest, co-introducers of the Class of 2013, and George O’Brien, the magazine’s editor, await the next winner’s walk to the stage to receive their plaque.